Evil from beyond has come to the museum! In Elder Sign, 1 to 8 players take on the role of investigators struggling to combat one of the Ancient Ones - vast, powerful creatures that dwell in the space between dimensions. By rolling a pool of special dice, players will face adventures in and around the museum that has become the focal point of these strange creatures. 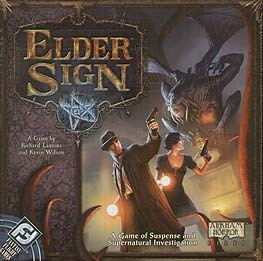 The investigators' courage and skill will earn rewards, the most prized of which is an Elder Sign, the eldritch symbol used to seal away the Ancient One and win the game. But the clock is always ticking and each night at midnight, the Ancient One gets closer to waking up. If the investigators take too long to seal it away, the Ancient One awakens and humanity is almost certainly doomed. If you only buy one Cthulhu game ever, then buy this one and all it's expansions! It's really my favourite game of the year. This is hard to say because there are so many great games to play at the moment. Cthulhu is a testy subject because purists (cultists?!?) want to see Lovecraft treated reverently whereas gamers at clubs also need a good 'Scooby Doo for grown-ups' romp through dark passageways fighting ooglies. Elder Sign somehow manages to do both things well. FF have made here a fusion game with elements of Board, Card and a Dice-locking game all put together nicely. There is even depth of eldritch subject matter included through the beautiful artwork on Tarot shaped cards and the enigmatic handwritten texts at the top of each Adventure. If you want more of the latter text then you would be better off playing Cthulhu RPG or FF's RPG/Card game crossover - Arkham Horror LCG. I play both but it has to be said that Elder Sign is a more sociable game and it rarely gathers dust on the shelf. I really recommend this to you. A good game in which the players take different roles and use dice to discover and hopefully conquer a haunted museum. Fans of Arkham Horror & the new Eldridge Horror should like it as a way to get a 'quick fix' in around 30 minutes to an hour, rather than the 3+ hours of Arkham. It's a tough challenge and you will almost certainly lose horribly on your first few attempts, but that's what a good co-operative game should be! A co-operative dice and card game for 1-8 players. You roll dice to achieve the requirements on your chosen card (from several laid out for the players to use) to gain Elder Signs, which prevent the ancient one form awakening. Too many Doom tokens on the characters on the Doom Track wakes the evil and you lose the game. When completed, the cards give you additional items to use and can also be used to buy certain items in the 'shop' area. The artwork on the cards is amazing and I like the way each player is given a character to play as, meaning special abilities, so it really can make a difference as to which characters are in play. This is a nice game as it can be played solo or with up to eight so you can have many friends playing too, this game is great fun with any amount of players and is very involving. Also, being co-operative, you work together to defeat the monster(s). As is to be expected the artwork is in keeping with the Arkham Games theme and the component quality is very good. In fact some of the tokens are better suited to the theme than the normal Arkham Horror game. The characters are exploring a museum steeped in the usual Arkham Horror mythos meaning there are monsters, magic and mystical traps to overcome to try and prevent the ancient one from arising and devouring the world. Players either stay at the entrance to heal, buy items from the shop using trophies gathered, rolling for random rewards or by tackling adventures in one of the various rooms in the museum. A lot has been said that this game is easy and that the rules are broken. Well from my experience, which admittedly is still only a few games, the game drips the theme and each game I have played could easily have ended badly given a different choice or a bad dice roll. For me though, whether I win or lose an Arkham game, its all about the theme and the atmosphere generated by the players. If you get the right people playing who buy into it all the game is a joy to play and you get cheers as people get the right symbols on the last roll or the collective sigh after a horrible fail or character loss. As to the rules, I found them easy to pick up and teach to new players. Are they perfect, no there are places where examples or more clarification would help but they are far from broken. I have to say this was an excellent purchase and I really enjoy playing this. It has all the look and feel of its big brother, all the same atmosphere and enjoyment but with simpler gameplay and can be played even with a large group in around 2 hours which is great. I would recommend this game for fans and non-fans of Arkham Horror, but if you play with a larger group I would recommend thinking seriously about how you sit people around the game everyone needs to be close. The reason is that they need to be able to read the flavour text on the cards but also it helps everyone interact on each others turn helping to enhance the atmosphere of the game.